Twas the night before Christmas, when all through the land, the mice were busy stealing all the cheese with their hands. 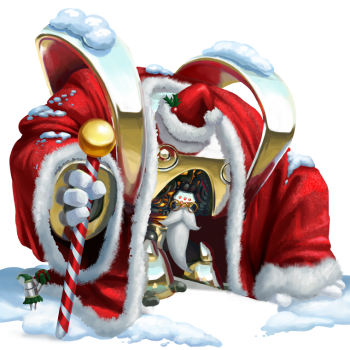 When all of a sudden, a mouse came too near, to the wrong monstrobot chromed in Santa's gear. With a whirr and a whistle, it stirred right to life, and came down on that mouse, with the fury of its might. The mouse was now gone, the cheese still there. It powered back down, for another mouse to appear! The Kris Chromo Trap Skin can be used on the Chrome MonstroBot. The trap's stats (power, power bonus, attraction bonus, etc.) are not changed. The Kris Chromo Trap Skin may be made available during the annual Great Winter Hunt event and can be traded on the Marketplace or through Give To Friends. 11 December 2018: The Kris Chromo Trap Skin was released as part of the Great Winter Hunt 2018. This page was last edited on 6 February 2019, at 14:40.